Large cherry producers are beginning to experiment with various automated or mechanized processes for picking cherries, and stem-free cherries are also on the horizon. 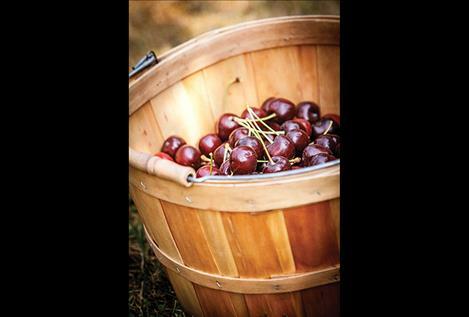 POLSON – Gibberellic acid, stem-free cherries and cherry powdery mildew were just some of the topics discussed at the third annual Montana Cherry Symposium, held Sept. 14 at KwaTaqNuk Resort. Sponsored by the Montana Department of Agriculture, the one-day event featured speakers from Oregon, Washington, Canada and Lake County. One of the local speakers, Desirae O’Neil of Westland Seed, told attendees about the various herbicides, insecticides and fungicides available locally. The Ronan-based store has 10 fungicides that can be used to prevent or treat cherry powdery mildew. 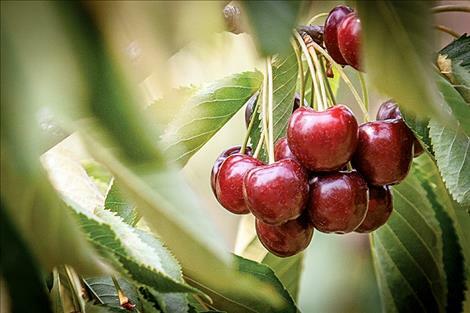 She encouraged cherry growers to only use products approved for use in Montana and explained how she was able to get one product – Unicorn DF, which consists of 70 percent sulfur and 4.5 percent tebuconazole – approved for use in the state last year after waiting three weeks. She shared another tidbit: “This year we moved from a liquid to a dry GA,” the abbreviation for gibberellic acid, a plant growth regulator. The product is mixed with water before spraying. Matt Whiting, a researcher at Washington State University, gave details of the cherry industry in that state, which is much larger than Montana’s. He said Washington growers had a record crop this year. Washington growers typically average around 5 to 5½ tons per acre, but some places had up to 18 tons per acre this year, he said. He recommended using 11 feet of spacing between rows of cherry trees and pruning the trees after harvest when the weather cools. He noted that organic blueberries and marijuana crops are starting to compete with cherries in Washington, which produces about half of the nation’s cherries. Any crackdown on illegal immigration by the Trump Administration means that the supply of cherry pickers will either remain the same or decrease, he said, noting that a shortage of labor in Washington over the past few years resulted in some cherries being left on trees. Large cherry producers are beginning to experiment with various automated or mechanized processes for picking cherries, and stem-free cherries are also on the horizon. “There is going to be a market for it,” Whiting said, citing examples from Spain and other places. On Saturday Bruce Johnson of the Flathead Lake Cherry Growers said he wasn’t sure how much local growers yielded per acre on average, but said overall the season was “not very good. When volume per acre gets too high, the fruit doesn’t get very big,” he said, adding that the price per pound wasn’t very high. The local cooperative doesn’t have the pricing information yet but Johnson said quite a few cherry growers didn’t harvest because the fruit was too small. He was pleased with the Cherry Symposium, and notes that local cherry growers contribute a half-cent per pound of sales toward a “cherry checkoff” or research and marketing program. That program, which was created in 2005 to help with education and controlling the cherry fruit fly, helps fund the Cherry Symposium each year.